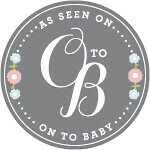 I’m finally sitting down to blog, boy have I been busy! This little munch keeps me on my toes, especially with her 45 minute naps! During that time I try to cram in a shower and some food, so hopefully you understand why the blog has been so quiet. For the last month I’ve been slowly changing up things in the living room. I got really sick of the yellow and sold the ottoman and bought the CB2 Peekaboo acrylic coffee table. Once it arrived I was very underwhelmed, I just wasn’t feeling it for the space and I couldn’t help but picture little Zoe bonking into it in the future. Anyway get ready for picture overload. You might also notice I painted the sunburst mirror gold. Doesn’t it look so much better!? Everything looks better in gold (words I live by). I need to have more fresh flowers in my life. I had been lusting over this brass tray for a very long time, I don’t know why I waited so long to get it because I think its absolutely stunning. I decided to go with a more neutral ottoman this time around, it gives me more room to play with colors. Ummm $10.00 ikea pillow. Yes please! While at ikea I picked up some Ritva drapes, I love these drapes! Not only are they a great price but I love how the light shines through so beautifully. I added grosgrain ribbon, such an easy DIY and so chic. can’t forget to give credit to my little stylist for being so patient while mama snapped away. Love love love! Love the new ottoman, love the new pillows, love the new drapes! 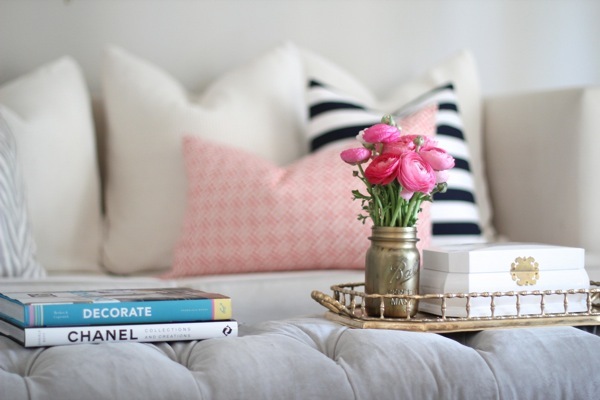 I’m so glad you stuck with the tufted ottoman, the new one is gorgeous! Zoe will be climbing all over in no time! Don’t want boo-boos for the little one. Thanks Sissy!! Me too, no boo boos for zobo! LOL Thank you!! I feel ya, I now have about 50 toys sprawled out, a massive exersaucer, swing and play mat taking over the space. Looks great! Where is the ottoman from?? That space is so lovely! The drapes and ottoman are beautiful! And that brass tray is so pretty. I just received the same CB2 table yesterday and had the same reaction. Total bummer because I’ve been lusting after it for months! I have the same sunburst mirror and was wanting to paint it gold as well. How did you paint it? Love the space absolutely gorgeous!!! Where did you get the ottoman? Target does it again! Amazing deal! Beautiful! I love the navy/coral pillow combination. Love it!! Gold, gray & coral. You can never go wrong! 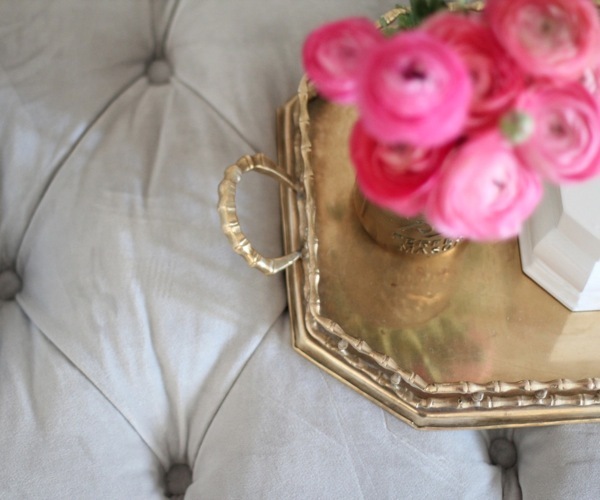 Love the ottoman and slightly obsessed with that tray! Lovely lovely!! Gotta get me a can of that gold metallic spray paint and something to paint! Can I ask your wall paint color? So lovey. beautiful!!! i love everything about this room!! what color are your walls? absolutely gorgeous room! I love it…and I’m dying over the sunburst! I’m trying to find the perfect one to hang above the couch in our living room. Beautiful room! Where did you get your darling ceiling fan? LOVE this room. Where is the trellis rug from? Hi! Looks great! Love your style! What type of ikea drapes did you use for baby closet? Love the drapes idea instead of closet doors:) thanks! You can find the tray on etsy or eBay! I found mind on etsy. I just LOVE your living room!!! So jealous 😉 Where did you get your white couch from? I love the paint color on your living room door! Can you please share what paint color it is? You’ve got such a great eye! I adore the new wooden table in the living room! Where did you find it? Your room has a very fresh look. Nice! I have a question about the ribbon trim on the drapes. I’ve been considering doing the same thing. Your ribbon seems to be a substantial size. Can you tell me how many inches wide it is? And did you wrap it around the edge of the curtains? Or is there any white showing at the edges of the curtains? I’ve seen it done both ways. I love the curtains… Can you explain how you added the ribbon? Thanks! I just used fabric tac and glued them on. Super easy! 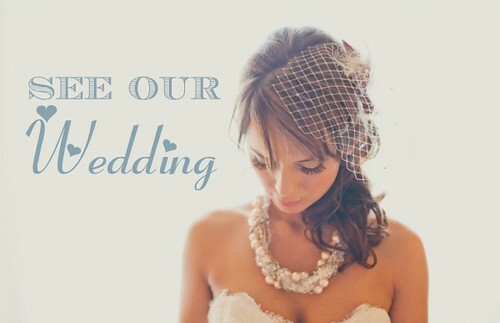 Hi, I just found your blog and just love it. Can you tell me where you bought the sunburst mirror? It’s gorgeous! Love how you painted it gold. I’m trying to find the perfect one and this one looks like the one! Thanks. I actually found the mirror off craigslist so I’m not sure where its originally from. Absolutely gorgeous decor. Where did you get the White lookalike Fillagree urns from?